Most basically, the station will be moved into Byron Park. As shown in the inset photo (click it to enlarge), it will be configured as a 10mx100m open cut with a "headhouse" at one end containing the fare gates, stairs and elevators, etc. The train platform itself will be around 6-7m below grade. As an open air station, it won't require a fan plant. The previous iteration at 747 was entirely underground (the NCC would allow only a tunnel) and would have required a large fan plant in the NCC greenspace. Importantly, in my mind, it brings the station closer to the majority of people who will be using it. Reaching it won't require crossing Richmond for the many riders south of the station, and I believe it will be safer. The new location results in an estimated cost saving of $10 million. Putting on my hat as a councillor with a duty consider the welfare of the whole City, I can't ignore the benefit of that in terms of reducing the cost of LRT for future generations. There are, however, drawbacks. The key one is a loss of greenspace. I agree that this is significant. It's mitigated somewhat by the extensive landscaping and programming space improvements in Byron Linear Park that are forthcoming as part of the LRT project. But, for those who would prefer to keep this as open, grassed space, that's a legitimately asserted drawback. I believe that the park improvements are going to make the whole park better, and that in the balance of public interests here, the benefits outlined above outweigh the drawback. I absolutely understand that many will disagree. There are also multiple concerns raised around traffic impacts. I wish we had had a more comprehensive consultation opportunity because having given these lots of thought, I don't consider that the move will result in significantly changed traffic patterns compared to the 747 location. The pick-up and drop off for 747 was going to be on Byron around 90m east of the new location. We have extensively calmed Byron Avenue, and Redwood will continue to be closed off as originally proposed. There may, of course, be the need in future to adjust and react to inappropriate driver behaviours, but I don't believe that we will be faced with significantly different scenarios between the 747 or new locations. I have also heard concerns over noise. That's legitimate, though I would encourage everyone to go see the train testing in the eastern part of our ward. Noise was a major concern of mine in Stage 1, since put entirely to rest since I've seen the trains in action. Based on what I've seen and heard, combined with the fact that the train platforms will be 6-7 metres below the surface, I don't believe residents will ever be disturbed by their operation. On social media, I've seen questions posed about safety. Again, I absolutely understand that having a 10m open trench in the park will raise those questions. I'm assured that it will be properly fenced. Throughout most of its length, the LRT is open air (for example along the length of Scott Street next to the MUP) and I'm confident that it will be safe. We also need to address the question around expropriating 747 Richmond: whether the station is at 747 or this new location, that property must still be acquired in order to build the LRT. It will be completely dug up to build the rail tunnel underneath, and the change in station location doesn't change that. One change, though, is that the 747 property has been on the City's radar (and mine) as an opportunity to build affordable housing near transit. With the previous location plan, building on top of the station at 747 would have required around $5 million in work to ensure the structure could handle a mixed-use development on top. Staff assert, and I believe, that that investment would never have been recouped by the City. It would have been a lost sunk cost. A word on that future development, and zoning in general. First, I need to emphasize that there is no concrete plan in place to build anything at the 747 site. The availability of that site for some kind of affordable housing, likely in a mixed-use, mixed-income building will be part of a more comprehensive plan that will come later this year to put in place a policy of building affordable housing near transit. There will be multiple steps and consultations when an actual plan is put in place to build there. And, I'd like to reassure residents that staff have been clear with me for several years that they agree the height limits on that site imposed by the OMB will be respected. 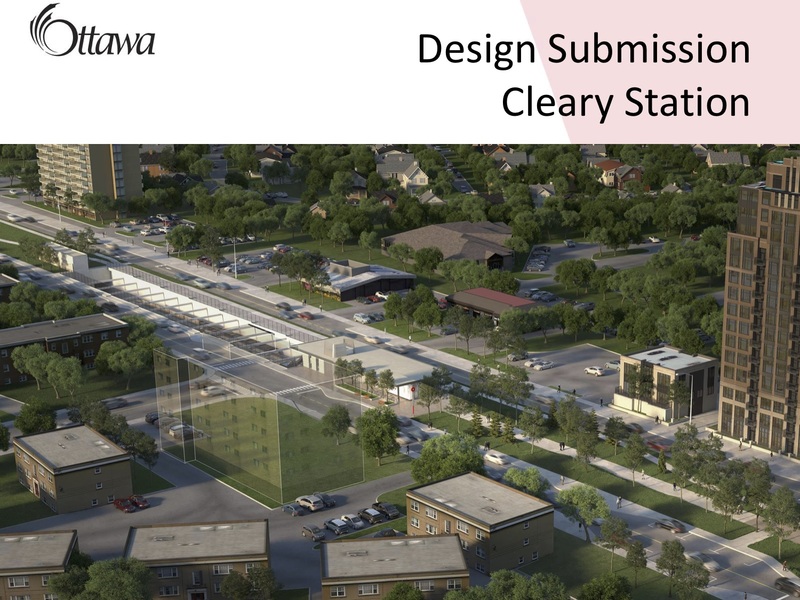 A clear concern I've heard expressed, as well, is that moving the station closer to residences will make it more likely that the south side of Byron could see denser development than we have anticipated in the new Cleary-New Orchard secondary plan. Unfortunately, I can't provide any guarantees on that front. I believe the new plan will be respected for at least the next decade or longer. Moving the station this relatively short distance doesn't to my mind reduce the defensibility and underpnnings of that plan, which contemplated transit in very close proximity to the existing residential areas. Long term? It is always open for a developer to come forward with a proposal, and some future councillor and Council may be asked to deviate from the plan. This shift, however, doesn't make it any more likely that some future zoning change will be approved. The centre of the magic circle simply isn't shifting far enough. For several years, I've been convening a working group of the City and ward residents who live nearby, including the McKellar Park community association, in what has been an honest, rich discussion about the LRT2 alignment. At times, we've met monthly. This supplemented the larger public consultations in a meeting format that encouraged dialog. Last summer, while the bidders were preparing their bids (the "in-market" period), the bidders told the City that they considered a move from the proposed 747 site would have multiple benefits, and we discussed that at our working group. In October, just prior to the municipal election, the City presented the possibility of this change to a general meeting of the McKellar Park community association. The commitment we had was of further discussion if the change was, in fact, allowed by the City to move ahead as part of the larger Stage 2 contract. I was expecting a lot more discussion before the vote. That didn't happen. As I'll outline in a later post outlining the Stage 2 vote, the community had roughly two weeks to be made aware of the change, digest the information, and weigh in. That's insufficient time. It's not just Cleary but the broader Stage 2 approval for which there has been - after several years of very rich consultation - insufficient discussion with community about this significant change. The decision has been made, and I'm comfortable that it was the right one. I'm not comfortable that the community has even begun to digest it. While the decision now seems irrevocable, my commitment is still to work closely with the community on the impacts. I want to better understand the expected traffic impacts from the change so we can be proactive about addressing those. And, I'll work with Councillor Kavanagh and staff to do the same work with the community that I've done around Stage 1: ensuring that the community understands the expected construction impacts, and has a voice in trying to mitigate those with regular meetings. With time, now, I hope to get many of the specific details to residents as I get those from City staff.